I've started watching this series, and after the first episode, several things occur to me. The first episode recalls the films in a few ways. Obviously, it's not exactly the same, but for example, both the first film and the first episod of SAC start with Major Kusanagi jumping off a skyscraper roof to attack criminals. Another similarity is Geisha robots attacking their clients (shades of GitS2: Innocence, though that movie came out after this series). Obviously this is taking place in the same universe, so you'd expect such similarities, but I do hope that the series isn't just rehashing the same ideas over and over again. Indeed, there are some differences. For example, there seems to be an element of lighthearted humor here that isn't really present in the movies (at one point in the first episode, Batou turns his head, smiles, and says "I think he broke" in a sorta goofy way. Also, the Major seems to be a little... less intense... than she is in the movies.) In any case, one episode is not enough to make a real comparison, and maybe they were just trying to get people into the series by referencing conventions from the rest of the GitS universe. I'm watching this on Netflix's online service, so I don't have a choice but to watch the dubbed version of the series. However, the dubbing at least seems better than the first film (the second film inexplicably does not have dubbing). Then again, the first film had some of the most atrocious voice acting I've ever heard (though perhaps some of that is due to the writing/translation), so perhaps that's not saying much. The animation is notably inferior than the two feature films. The first film used a more traditional animation technique, while the second film used an interesting blend between traditional and computer generated 3D imagery. The series also uses CG, but it's much less textured or detailed and the movements are a little less fluid. I'm guessing this had something to do with budgetary or time constraints (producing 26 half hour episodes must be more resource intensive to produce than a 2 hour movie). However, while the animation did seem odd initially, I'll probably get used to it. It's not that bad, and it's not like I frown at live action movies with poor special effects or video games that don't have eye-popping graphics. The important thing to me is the story and the ideas. 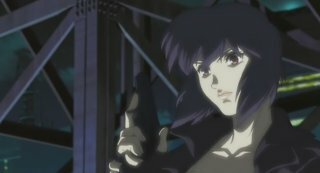 Speaking of which, another thing that's becoming apparent about the entire GitS series is that they either have intentionally obtuse plots, or something is getting lost in translation (or both). The ideas underlying the series are definitely very interesting (and I believe that's what I responded to in the first two films) and can be challenging. This first episode seems more plot-centric than the films (which isn't necessarily a bad thing), but I definitely think there's still something that's lost in translation here, and perhaps not just when it comes to language (though that's probably a big part of it). It might be cultural (or political) references I'm not getting either. The first episode of SAC is not as difficult as the first film. I got the basic idea of the plot, but I got a little tripped up by all the detailed references to military or governmental organizations. In any case, it doesn't seem to be a coincidence that both movies are a little difficult to understand (though the first is worse in this respect than the second) and so is this first episode. More thoughts as I progress through the series... again, I've only watched a single episode, so it's probably not fair to make some of the statements above until I've seen more of the series. Your last point: to me, that's just how pretty much all science-fiction works. The first thirty or so pages kind of dump this great chunk of FUTURE on the reader (or watcher), and it takes a while to sort it all out--especially if any of the initial FUTURE-dump is skewed by the characters' point of view, or if parts turn out to be inaccurate later on. I know I got a lot more sense out of the first episode after I had become accustomed to the world (Stand-Alone Complex was where I started watching). There's certainly an element of that (and that's part of the reason I like SF), but I'm pretty well versed in the standard SF tropes, many of which GitS adopts. The technology and ideas in the series are my favorite part of it and I don't have much trouble getting the main concepts or thinking through the implications. Also, I've got some experience with the series, so I'm not going in completely blind. I don't have much trouble with other SF either... so I again come back to something that's lost in translation or something that's deliberately obtuse. Perhaps both.